After being bitten by a radioactive spider, Miles Morales (Shameik Moore) becomes the one and only Spider-Man. However, after a portal to other realities is opened, he discovers that more than one person can wear this mask. Uniting with his counterparts from other dimensions, Miles has to stop a threat to all reality. Just when you think the world of animation couldn’t possibly become any more impressive, along comes Spider-Man: Into The Spiderverse - a hugely entertaining, visually stunning film that works on many, many (geek-heaven) levels. 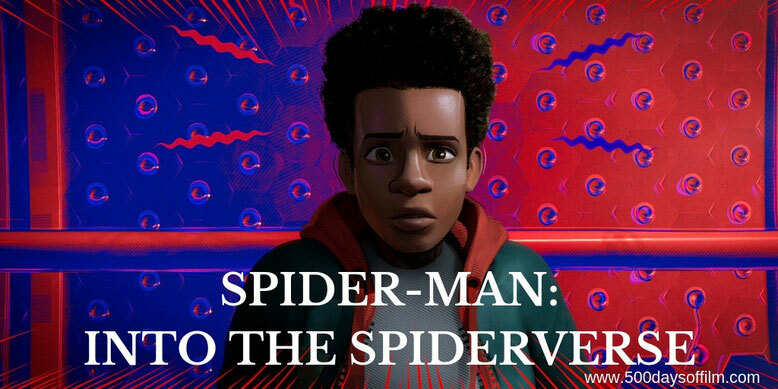 Directed by Bob Persichetti, Peter Ramsey and Rodney Rothman, Spider-Man: Into The Spiderverse focuses on the endearing character of Miles Morales (wonderfully voiced by Shameik Moore) and his Spider-Man origin story. Along the way, the movie explores the very many iterations of Spider-Man (and associated merch) and finds, via a portal to other dimensions, a way to bring several of these heroes together. The journey is full of exhilarating action, Spider-nerdy deliciousness, laugh out loud comedy and brilliant vocal performances from a super impressive cast. The end result is a film with an important message (anyone can be a hero) that will entertain everyone - from younger audiences to seasoned comic book fans. If all that wasn’t enough, the animation in Spider-Man: Into The Spiderverse is also utterly breathtaking. The film is a real joy to look at - it feels like a comic book that has magically come to life. Meanwhile, there are also many stunning, photo-realistic animated scenes and several moments of astonishing creativity (watch out for a truly amazing moment involving a cityscape). However, these elements would be largely meaningless if Spider-Man: Into The Spiderverse hadn’t also contained heart to spare. Amid the film’s action and adventure lies a moving story about friendship, individuality and the bond between a father and son. There are two poignant (and perfect) tributes to Stan Lee in Spider-Man: Into The Spiderverse. Warning: the last, just before the end credits, is a really emotional moment. There is also one genius end credit scene after the movie. However, I really loved the final credits song! Have you seen Spider-Man: Into The Spiderverse?